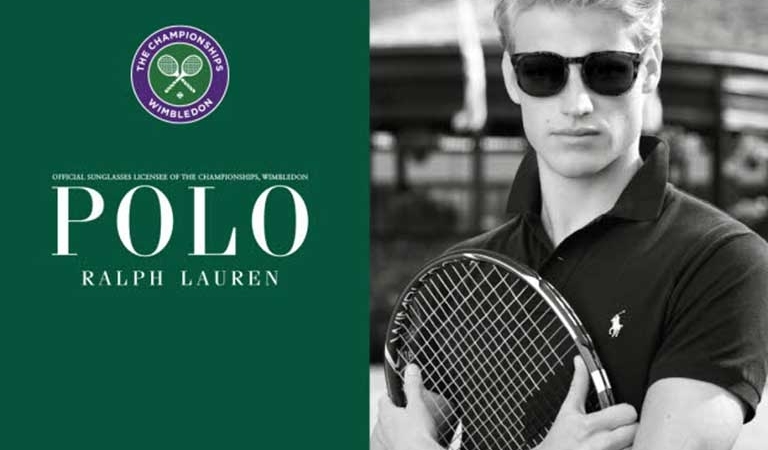 Polo Ralph Lauren has recently announced its partnership renewal with The Championships, Wimbledon, which will be held this year from June 27 through July 10, thereby confirming its presence as the official outfitter and adding a dedicated sunglasses collection Wimbledon by Polo Ralph Lauren. As official outfitter since 2006 of the most prestigious world tennis event, the only Grand Slam played on grass, Polo Ralph Lauren has embraced the values of The Championships: elegance, prestige, respect for the rules and sport in the open air, which are part of the Polo Ralph Lauren heritage and the American way of life. In the eleventh year of its collaboration with Wimbledon and on the occasion of the celebrations for the 130th anniversary of The Championships, Polo Ralph Lauren has redesigned the uniforms of the umpires and on-court officials in the same impeccable style, with the addition of a dedicated sunglass style. The unisex frame features a classic inspired shape with the signature colours of The Club, with dark green nuances and a purple signature pony logo. The style sports a Wimbledon by Polo Ralph Lauren inscription heat printed inside the right temple and it’s sold together with a dedicated vintage inspired brown leather case featuring The Championships logo. For fans and consumers, Polo Ralph Lauren additionally offers a Wimbledon lifestyle collection featuring fashion and commemorative items. The eyewear is available at Polo Ralph Lauren Shop in Shop at Wimbledon located close to Court One and Centre Court, Wimbledon.com as well as in selected David Clulow Stores.